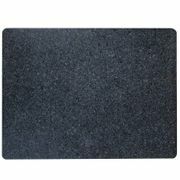 Replace your worn and possibly unhealthy plastic or wooden cutting board with the HealthSmart™ Granite Cutting Board. Sleek and sophisticated, the polished gray and black colored granite construction features easy clean up between food prep chores. The solid granite construction will last through a lifetime of kitchen tasks! Rounded corners. EVA feet for secure grip on countertop or table during use . Measures 16" X 12" X 1/2". Comes boxed. Weighs 12lbs.